Looking for a speaker or trainer at your next business event? I’d love to help. I’m happy to discuss tailored talks, training or workshops to suit your audience, their needs and existing knowledge. As well as engaging and entertaining your audience I’ll teach them how to tap into the power of Internet marketing and send them away with actionable tips they can use to succeed online. I’m a qualified and experienced teacher and my key concern is to facilitate workshops that are fun, informative and inspiring. Annabel Candy is a digital strategist, web designer and web copywriter with an MA in Design for Interactive Media and 18 years’ experience. 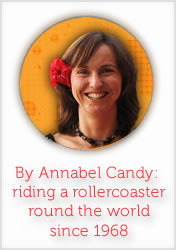 Annabel’s travel blog Get In the Hot Spot attracts a thriving community of engaged readers from all over the world. Over 175,000 people visit her blog each year with over 14,000 unique readers each month. Her writing, on topics as diverse as business, travel and wellbeing, has featured on some of the most popular blogs on the Internet including the Huffington Post, Gadling and Copyblogger as well as in print in Australian Traveller, Senior Traveller and Escape Magazine for the Sydney Sunday Telegraph. Annabel is the author of Successful Blogging in 12 Simple Steps and is passionate about helping small business owners and marketing managers tap into the power of the Internet. As a popular travel blogger and busy entrepreneur I tend to get booked up for speaking and training in advance. To find out more about engaging me for speaking, training or workshops please contact me now to avoid disappointment. Email me today (annabel at GetIntheHotSpot dot com) to find out more or to organise a time to talk about how I can best help you.